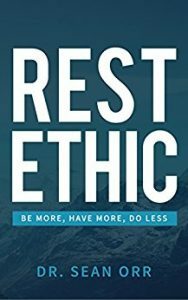 Dr. Sean Orr argues that your rest ethic, or efforts towards resting and recovering, is just as important as your work ethic with regards to your life, career, health, and relationships. He discusses how we are in a modern day epidemic of not allowing ourselves to rest. Not only is this making it harder for us to perform and keep up with our work demands, but it greatly is affecting our health, energy, lifestyle, and our relationships. Through this book Dr. Sean Orr encourages you to work on your rest ethic in order to perform better and be a better you. He discusses strategies that are very practical and applicable to everyone’s lives. The topics are Energy, Lifestyle, Sleep, and Flow. Dr. Sean Orr is a Chiropractor in Stratford who adjusts using the Activator Technique. He also presents at the Activator Seminars in Toronto.